Hear, hear, Hallie. Well said. Like another post you made - we don't share these experiences because we want to change the minds or perspectives of others. We share because that's our support system - others respond that they understand, or we are letting others who might feel alone know that we understand. That's all. That was a GREAT post! Thank you for putting words to my feelings. Very well said. That last huge paragraph says everything I've felt in the last year since my daughter was diagnosed. Thank you. I agree what you said about being grateful for what we have but I feel that some people just says things in a attempt to comfort us, of course they don't know trully how we feel and how appreciative we are of what we have but don't take it so seriously, don't let things like that make you upset or angry, it's not worth it. It's like somebody you know passed away and you say "I'm sorry for you loss, I know how you feel"; Then you think: "oh please, you don't know what I'm going through". Pleople say things like because they are just trying to communicate; just trying....trying in their own way. Thank you to putting such eloquent words to what so many of us D-Moms feel! Exactly! This with Cherries on (but only if we know how many carbs). Amen! Could not have said it better. Because we normally don't share all of the things you've documented, our friends and family like to think we have it "all under control." And, don't really want to know how hard it is to juggle it all nor how much we worry about it all. Thank you for this post. You said, so eloquently, what is often very difficult to put into words. Today I spoke with a coworker today who is my age (late 20s) and a cancer surviver. We were brought together by someone else's stupid question about my diabetes: "Is it manageable?" I simply said "do I have a choice?" Coworker looked at me and said "people used to ask me that, or how I do it, especially when I was in the hospital for a month. People are so stupid. When he choice is do it or die, there is no choice, you just do." So no matter what your "thing" is, no one can really understand it perfectly. But, people with their own, even "worse" things, share that sense of same with you, and you can shake your heads at the "regulars" together. People are ignorant sometimes, but it made for one awesome blog post... just sayin! Love this post. "There is darkness in this disease" I just love that line. So very, very true, and especially the part about acknowledging it. Very well said! Love this post. "There is darkness in this disease" Wow, so very true! And the part about acknowledging it really rings true. Very well said! This is exactly what is running through my mind at all times! It is comforting to know that I am not the only "crazy" mom that worries to death about all of these things! I hope you don't mind if I share it because I really could not have said it better myself! So well said. 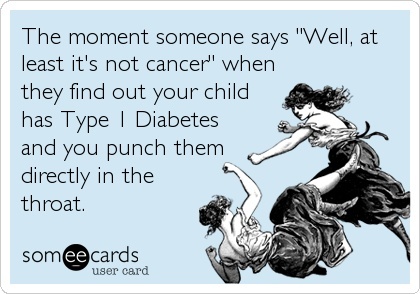 I find myself feeling guilty when I feel sorry for myself because of my T1D. And it's totally that "it could be so much worse" reasoning. Thank you for your encouragement. 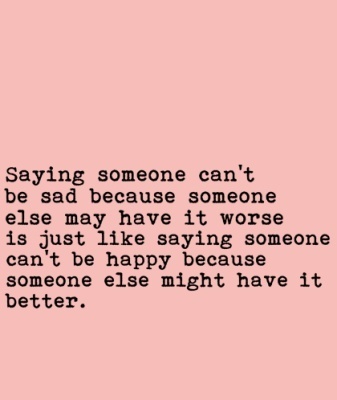 You are so right - "just because someone has it worse doesn't mean we can't feel sad." Thank you for this post. I love your blog!